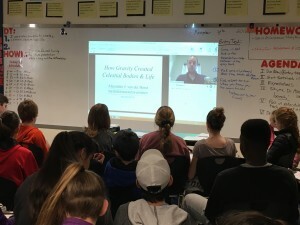 Today, eighth grade scholars had the opportunity to Skype with their first space expert of their expedition: Are We Alone. Dr. Alexander Van der Horst is currently a professor of Astronomy at Georgetown University in Washington D.C. and has worked for NASA and the University of Amsterdam as their exploding star and radio telescope expert. His presentation focused on the learning target: I can explain how gravity created celestial bodies and life. His slides can be viewed here. How do we know how cold molecular clouds are? How far do you need to travel in the solar system before gravity no longer pulls you? What happens to the stuff that goes into a black hole? Does matter return after being ripped apart by a black hole?